The 5th Annual Great Pumpkin Float around Lake Sammamish was a big success. It’s a Halloween celebration with 500-1000 of our neighbors just one home at a time. We play Halloween music at full volume and flash spotlights into their homes so they see us coming. About 1/4 of the houses have someone home and see/hear us. They run to the porch or windows waving and flashing their house lights or flashlights (cause we can’t hear anything and it’s hard to see in the dark). It’s great to see the excitement in the kids, especially as Trick or Treating can be difficult in parts of this extended “neighborhood”. This year was great with Colin Dana, Kristina Owen, and Marisa Rose on board to make it a party, and share the driving, photography, and spotlight work over our 4 hour circumnavigation of the lake. Despite a very discouraging forecast the steady rain held off till after midnight when the boat was put away. Great thanks and support on Nextdoor LakeSamm from so many folks. Finally after a 5 year long email thread, multiple meetings with Sammamish Parks folks, and even a City Council appearance, we have cleats at the Sammamish Landing North Dock that can be used by boaters! Hurrah! You can now dock your boat and go for a jog on the East Lake trail, or have a picnic at the park, or use the nice new restrooms if you are out on the north end of the lake, or have someone park at the lot and meet you on the dock. Finally Sammamish Landing Park is a “Landing” for boats. Some history of this issue: Sammamish Landing park opened in 2013, but the brilliant designers who put the posts outside of the dock surface, (instead of embedding them within the dock edge as is common practice) didn’t recognize that there’s no way to tie up a boat with a 2 foot concrete piling between the boat and the dock. They put in nice big boat cleats, it was just that there’s no way to use them because a boat won’t safely fit between these pilings and the cleats were on the side with the pilings. So even if you can catch the dock on the side without the piling (there’s nothing to hold on to on the dock edge) and step off, you had to tie your dock lines to the opposite side of the dock, creating a trip hazard, requiring longer lines, not securing the boat as well, and generally looking stupid. This is obvious to any boater who spends 10 seconds looking at the dock. Jackie Schmidt (also of LSYC) and I sent emails to the parks folks soon after the docks opened, expecting this fix might take a week to get a guy with a wrench to move the cleats from one side to the other. It did not. We presented it to the Sammamish City Council, which approved the change. But then there was a city lawsuit over the poor dock design / manufacture (in addition to the idiotic piling placement, the docks also broke apart in our winter storms). Finally that ended and we though we were back on track. But the person we were working with left, and we had to start over with emails. Then they couldn’t make the change in the fall because of “considerable logistics to attaching the cleats due to challenging access of the dock infrastructure which is required to install the mounts.” But I visited this weekend and was surprised and pleased as punch to see the cleats are finally on the proper side where they can be used. Now it would have been better if the pilings were on the south side as our summer winds are generally from the north, and it would have been better if the swim ladder was on the end or the other side, and if one more cleat were added near the offshore side of the swim ladder would have made it possible to dock a 2nd boat on the other side of the swim ladder (behind my boat in the photo), but at least we finally have 4 cleats on the correct side of the dock in 2018! Note the South dock (the “L” shaped one) had it’s cleats removed as the non-piling side is in the swim area (Even though swimable temperature is only 4 months of the year). Boats are not supposed to dock there. Thank you Jackie for staying with me on this one. Now that it’s here, feel free to enjoy it. I guess persistence does pay off. Sorry AGAIN. With the forecast calling for a 75% chance of heavy rain for most of Saturday, and high winds gusting to 20 mph kicking up waves Saturday night, and the lake level so high that most of the docks are underwater and thus invisible, we just can’t do the lighted boat parade tomorrow night. Sunday was better, but not much, and the lake levels are still high. So we are pushing the parade to next Saturday 12/19. I know we will lose a few more boats, but we really had no option. The State Park Beach Bonfire event is CANCELED, too much involved in trying to pull that off for a 3rd target date, and the high water has covered the beach. Current forecast for next week is the best we’ve seen with only a 20 % chance of very light rain, winds of only 2 mph and we might even see some moonlight. Let’s hope the 3rd time is the charm. That should give more folks time to get the home decorations up, as it’s been so wet each weekend, many of us are behind, and it’s certainly hard to decorate an under water dock. Let me know who is still in! I’m hoping we still have 4-6 boats, I’d love to get a few more to join us. Join our Holiday Lighted Boats Parade – let’s get more boats out there this year! Please keep your boat in the water or put it in for this event. It’s great to see the holiday lights & home displays from the water as a parade and we always get a great response from those on shore – flashing house lights and coming out to wave, and bonfires on the beach. Put on your warm coat, a lap blanket, bring a warm beverage, and we’ll ha ve a Lake Sammamish “sleigh ride”. It’s our own mini-version of the Christmas Ships. A little inverter works wonders with the today’s LED holiday lights, or an inflatable decoration to put on your boat. We are also looking for someone with photography skills/equipment (very low light, rocking boat) to join us on the boat, to photograph the best decorated houses on the lake and post the “award winners” on line. At the State Park Beach there will be bonfires, hot chocolate, decorations and luminary walkways (candle bags) and for the first time the Issaquah Singers chorus will lead the carolers on the beach. Last year we got coverage in the Issaquah Press and over a hundred people came out. We also had groups come out to watch on the beach mid lake east side and at the apartment docks on the north end. This year let’s get more boats and continue to grow this new tradition! Please email me at jim.mackey@gmail.com or just call me at 425-449-0070 to let me know if you have a boat the could potentially be put in the water to join the parade. Listen for scary Halloween music, then come to the window to see the Great Pumpkin float by on the lake. Flash your house lights to say Hi to The Great Pumpkin. We’ll try to photograph the best Halloween decorations, and post the winners in various categories, so decorate your house and docks! I’d love to have others join this event, perhaps a ghost boat, or a black light & strobe haunted boat, use your imagination. Let me know if anyone is interested in joining us – on my boat or in their own haunted vessel. The Great Pumpkin got most of the way around the lake, but the rain and wind as we came south on the east side made it hard to see so we had to stay further off the docks, and with the rain and wind noise fewer folks could hear to come to the windows – flashing their house lights, flashlights, or waving. So around the south/mid-lake buoy, we crossed to just north of Vasa, and headed home along the west shore. No photos this year as we (understandably) saw very few lake facing decorations out in these conditions. If anyone got photos or video of the Great Pumpkin, please post or email me (even if they are far or blurry). Here’s a new way to meet LSYC & others on the Lake! Bring your boats, beer, and togas!! 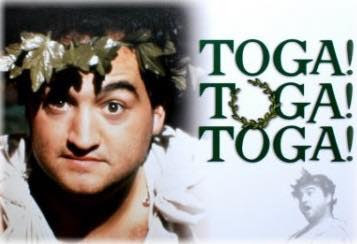 We are throwing an end of the summer toga boat tie up on the north end of Lake Sammamish. Let’s get as many boats together as we can and make this an epic party to end the 2015 summer!! Party starts at 5pm on Saturday September 19th. Bring your food and booze and plan on party on into the night!! 4th of July – TWO Live Band Raft-ups on the Lake! One of the best events of summer, hosted by the community that founded LSYC is on again this year! Thank you to Jen and Scott Baisch! Our website background photo is a panorama from their 2013 concert. Join the 4th of July Raft up in Abernathy Cove from 4-8 PM. Jen and Scott Baisch will have a band playing from the top of their dock, you’re all invited to anchor off and raft-up. This is a water only event, no going ashore. Let’s hope this amazing weather holds!! Remember to bring bumpers, anchors, dock lines to raft up and BE SAFE! Abernathy cove is a bit south of the point (bend) on the east side of the lake. You should see the boats and hear the music once you are in the area. Hi neighbors, I’m Danna and I live on SE 42nd St. 4th of July is just around the corner and Craig and I want to let you know that we are having a DJ and live Band beginning at 5:00 pm on the 4th of July. Bring a beverage and a bite and pull your boats up to a buoy and tie up for a Flotilla! Music will go till about 9:00 or so. Just in time to motor on down to see the fireworks from the barge. “Free Rain” will be our band, and “KNZR” the Hot new DJ will show his many musical talents. This is a free concert, unless of course you want to tip the talent.☺️ Keep in mind that there is apparently a limit of 5 boats hooked together. If you have an anchor, that is also an option. In short, pass the word and we will see you on the 4th! I’ll plan to start in Abernathy cove, our traditional 4th of July party harbor, then as that begins to wind down check out the new event as that goes later (till 9 PM and is closer to the fireworks). Have to figure out when we get dinner in there. Wow 2 bands same time, then fireworks, it’s like a free music festival. I encouraged Dustin to drop by with the new Lakeside Fueling fuel barge. You can learn about the service, top off your tanks, and rock-out all at the same time.